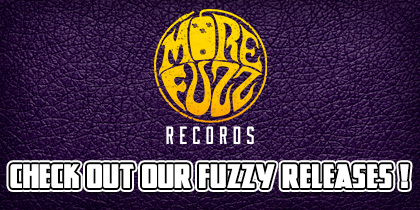 The Reflections of Fuzz are More Progressive ! Imagine if Fibonacci froze an ethereal seed collection of shrooms, evil looking orchids, hops, and agave, then placed them into a time machine set for 2017, and transported them to Nicholas DiSalvo, Jack Donovan, and Matt Couto in Massachusetts. (Obviously) The trio would hydroponically grow each seed, harvest, dry and ferment them, then place into a copper still and distill the dynamic brew concoction until just right. They invite Michael Risberg & Michael Samos to the studio where everyone would drink the magical potion, and record the album Reflections of a Floating World. Elements of stoner metal proggy psych stylings serve as a counterpoint to exuberant expressions of majestic heaviness. Their range, their killer instinctual edge for pushing the boundaries shines through. With all of that being said, Elder has done it again. 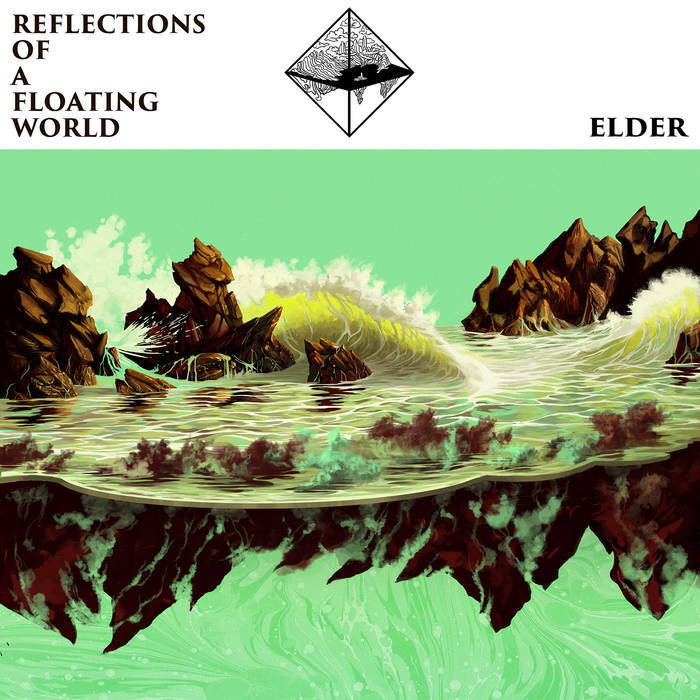 Following (in many connoisseur minds) 2015’s Lore as the album of the year, Reflections of a Floating World showcases Elder’s dedication to play at the highest level. They are innovators and ambassadors of the music scene. Each song on the album is a thought provoking full-length tour de cohesive sound. It’s a glorious record, with zero limitations, and it will haunt the gods! Reflections of a Floating World is another masterful work of art by Elder. It’s progressive as hell. Stoner metal sludge riffs and doom tones intertwine throughout the album, however, the attention to detail is cleaner and more refined than ever before. The sound of this album tells me, we’re experiencing a band who’s evolving in ways that only musicians with a mission know how to do. They push the envelope further and deeper. They’re certainly not shooting from the hip here. Reflections opens with “Sanctuary” and we blast off into a compositional mind-swallow. DiSalvo’s guitar riffs and direction drive the song into legendary realms, while Donovan feeds with deep sonorous lamentation, and Couto blows the lid off this thing with clean beats and full fuel injection energy. “The Falling Veil” might be Elder’s most matured song to date. The chilling ambient intro begins with a delicate and beautiful guitar passage, which sounds like we’re in an altered western reality. The inducing alien soul of this relaxing prelude makes me wish for more, however, instead it goes into madness. Duelling guitars swarm into fine tuned crushing of the skull riffs, and busy drive rhythms. What a blood pumping melodic anthem! Bobbing and weaving through emotion. It’s moving, crippling and progressive as hell. The sophisticated versatility of “The Falling Veil” will echo within the nervous system hours after listening. The massive riffs of “Staving Off Truth” has an extremely dark-vibey killer sound. The aggressive performance of this song is dynamically intensified with visceral neural stimulation. If you listen closely, you can hear elements of “Orion” by Metallica; not that this was Elder’s intention, it’s only my ears nostalgically reminding me that song exists. “Blind” is another lengthy in your face masterpiece. The structural detail is mind altering, to say the least. It will thrust your feet into the ground and then immediately blast you into oblivion. The keys are pristine, the voice of DiSalvo is vivid and dark, guitars, bass and drums are explosive! Elder showcases here how deeply tight and heavy they can get, but also how gorgeous and sullen. And for the breather (if you will). “Sonntag” takes off its Elder mask, and calms the mood down on the epic long haul — which found its way through over forty minutes of intense stamina. “Thousand Hands” is an immaculate ending to Reflections of a Floating World. I went back and forth wondering why this was the last song on the record, but I think I understand why. It’s clean, pristine, vivid, just like every song prior. In some ways, it represents the entire album, summing up the whole. Reflections of a Floating World is another wonderful futuristic take on progressive stoner metal. The production of this album is so rich. It’s detailed and balanced. It’s burning and fiery. Elder is setting a tone for the future, and will most likely prove to be an influential key towards many bands and albums to come. Elder is one of a few bands who is creating a blueprint of newfangled heavy. It’s almost like saying: ‘Here we are, and here we’re going. Levitate out of a drowning existence. Kill your little darlings and forget what you thought heavy is supposed to be.’ Progressive heavy is the new fuzz! It’s another juggernaut by Elder, and Elder is pushing the music scene. The multidimensional Mike Samos is on tour with the band as a fourth member. Adrian Dexter continues as the album art magician.